Biopic starring George Arliss, Boris Karloff and Loretta Young. The history of the famous banking family that came to prominence during the Napoleonic Wars in the early 19th century, only to be threatened by the subsequent rise of anti-Semitism in Europe. How the Rothschild dynasty rose from German ghetto obscurity to become the foremost banking house in Europe is a fascinating study of international monetary intrigue, early 19th century-style. 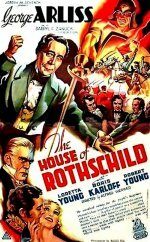 Set against a lavishly mounted backdrop of the Napoleonic Wars, commanding George Arliss plays two key roles - family patriarch Mayer and his son, Nathan and Boris Karloff eschews monster make-up for a change to effectively etch a civilised villain in this rather entertaining history lesson. Your dvd will be dispatched new (on demand) and sealed. We can guarantee this is the best quality version of this rare film available on the internet.